Should You Pay Off Your Auto Loan Faster? One of the interesting articles I read on CNN recently is one written by Jean Chatzky about paying off your auto loan as quickly as possible. When you have a loan with relatively high interest, the savings from paying it off can be substantial. However, even if you have a low interest rate, the article suggests tackling your car loan for the purpose of freeing up cash flow each month. Even if you can handle your car payment, and even if your interest savings wouldn’t be that big when you pay of the loan, your cash flow could improve greatly. Understanding how your money moves through your personal finances is an important part of good management. You need to know how much you have coming in, and when it’s coming in. You also need to know how much you spend, and when you spend it. The smooth operation of your finances isn’t just about money coming in and money going out; timing matters as well. Getting rid of a major payment in your budget can ease matters. In my situation, cash flow is especially important since I have a variable freelance income. If a client pays late, my bills are still do, so strategies to help me smooth my cash flow, such as having a cushion in my account, or linking my checking account to a low-rate personal line of credit, can help me smooth over the bumps. One way to build that cushion, of course, is to pay off my car loan ASAP so that there is “extra” money each month. 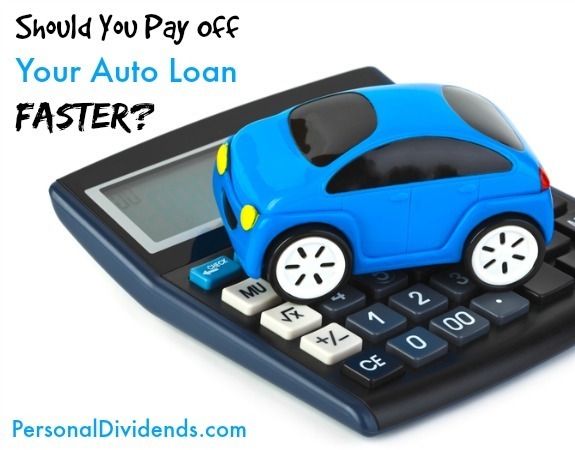 The CNN article suggests that paying off your car loan quickly could lead to the ability to build up money in an account that could be used later to help you buy a different car, or to be used as an emergency fund in the face of the unexpected. And, of course, one less payment to worry about in the event of a financial setback is always desirable. If your car is paid off, you don’t have to worry about whether you can make payments during a setback. While I think that there are plenty of people who would be more than happy to pay off their loans as quickly as they can manage, I’m not one of them. Yes, I like that one of my car loans recently ran its course and now there is an extra $339 in the account each month. However, I’m not in a rush to pay off the loan on my Subaru, purchased more than two years ago. I got a good deal, and a very low interest rate indeed. I could put extra toward paying off the car each month, but I recently upped my monthly investment contributions, and my investments are offering a better return than my loan rate. As a result, I come out ahead, numerically, by investing the money instead of paying down my low-rate loan. I’ve considered what happens if there is a financial setback in my family. The good news is that I’ve got that assets to pay off the loan altogether if I had to. However, I’d likely keep making monthly payments so that I wouldn’t have to part with that much capital all at once. In the end, you need to run the numbers for yourself. My current cash flow is smooth enough for me not to need the “extra” money, and I’m prepared for a setback. In my situation, I’m more interested in growing my wealth through investing than I am in paying off a low-interest car loan.